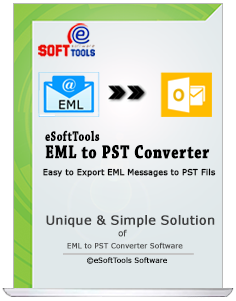 eSoftTools EML to PST Converter is an ideal solution to convert emails(*.eml) to MS Outlook PST email account in one click. The latest email client Windows Live Mail & Windows Mail saves their emails in .EML format, so if you have decided to switch Windows Live Mail or Windows Mail email program environment to Microsoft Outlook then you may absolutely face a major trouble, for the reason being MS Outlook doesn't Supports .EML email formats. 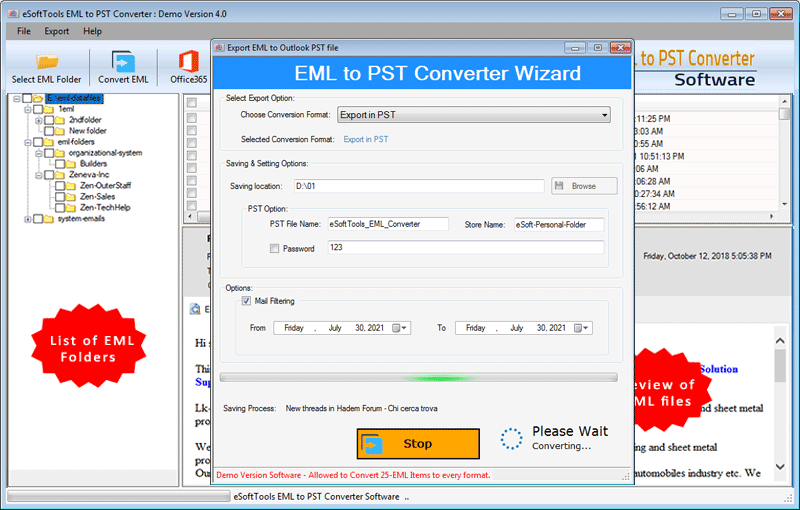 Use this EML to PST Converter Software that allows add multiple EML files one another after to make batch conversion of EML to PST Outlook file with maintains all preserve database. There is facility to export selective single and multiple emails from EML files into PST outlook file. 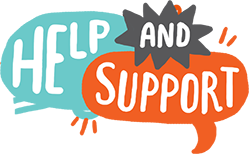 Helps users to create single and separate PST File for restoring items of EML files. Export selective items from EML files of any mail clients such as- windows, windows live mail, thunderbird and outlook express to PST. EML to PST export software have batch conversion facility, so you can export "N" number of email EML messages to Outlook account PST at a time by Add Folder Having EML File(s) button. 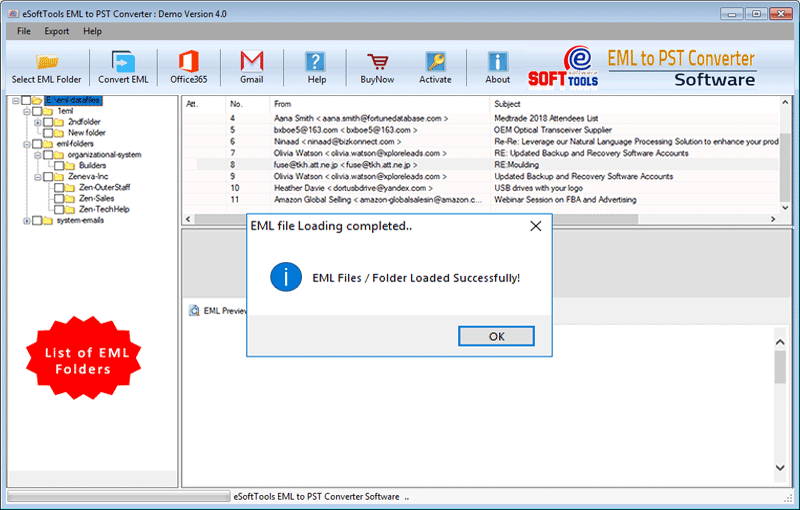 Add multiple EML file or folders for batch conversion of EML to PST File. 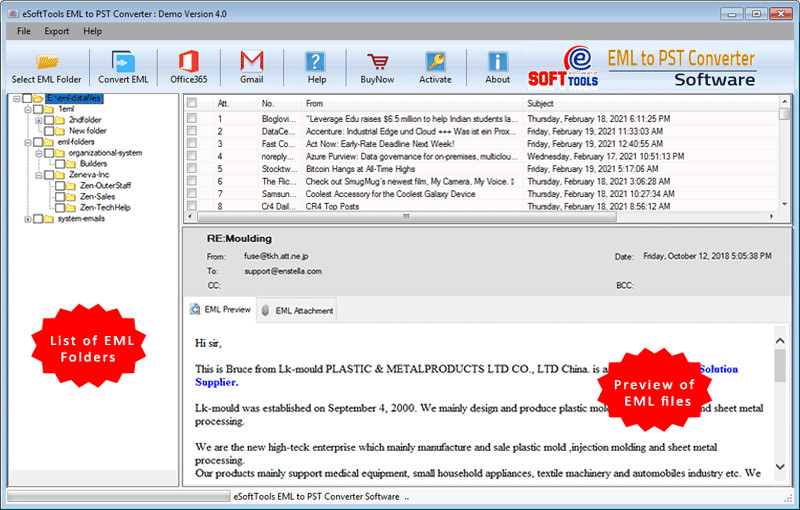 Export EML 2 PST software itself create New Outlook PST file which supported by all versions of MS Outlook including MS Outlook2016, 2013, 2010, 2007, 2003 & 2000. Instantly create New PST UNICODE File for saving the EML files items such as- emails, contacts, calendars and attachments. EML to PST Converter Software is best and supports Export EML files from all .eml files based application as like- Windows Live Mail, DreamMail, icewarp, Mozilla Thunderbird, Zarafa, Zoho, Outlook Express and windows mail etc to PST Outlook supported every versions upto 2016. EML to PST Software is 100% safe and great application that able to convert EML email files with complete elements - Meta data (to, cc, bcc, from, date / time), Formatting (style, fonts, image, signatures, hyperlinks) & more and also arrange EML folders, sub-folders during conversion. * Single Email Conversion Mode - Convert single email (.eml) file to pst. * Multiple Email Conversion Mode - Convert multiple email (.eml) file as bulk email conversion to pst at one conversion cycle. This mode save valuable time while converting batch EML to Outlook. Have Demo Version of EML to PST Converter Tool - A demo form gave the goal to take care of client's concern identified with programming working procedure, all clients are fit to utilise the demo form and inspect programming change quick process. Demo permits spare 30 messages for every EML documents into PST design at free of expense. I am using MS Outlook Express for many years and I want to open my EML emails in PST account, so can I use the tool to import EML to pst? Yes, you can access the emails of outlook express EML to PST by imported all the data of EML file to PST. I have Mac operating system along with few EML files so that require to Export EML emails messages to PST. Is it possible on the operating system I have? No, you can’t use the Software to export EML files in PST on the Mac OS. You can only upload EML files to PST on windows upto 10 using software. Is there any size limitation to Import EML file to PST account by Software? No, there is no file size limitation is defined on the application to performs the data of EML files to PST. Take simplest approach to deal with boundless measure of EML records move into PST record by utilizing eSoftTools EML to PST converter. Know in point by point well ordered working idea of how to import EML to PST cloud account. Thank you Much obliged to you such a great amount for giving this awesome EML to PST Converter Software that took just couple of minutes and relocate Windows Live Mail to PST. EML to PST Converter Software does not require the establishment of any outside utility to play out the information migration..thanks a great deal...thanks a lot.